Before I dive into this review, I need to come clean: I’ve never been a big fan of Anime, in fact I’ve nearly avoided the genre over the years. I’ve only ever watched the shows that interested me, and they’ve been few and far between. With that said, I’ve seen great Anime titles like Samurai X, Samurai Champloo, Cowboy Bebop, Gungrave, Princess Mononoke, and Spirited Away to name a few. I was hesitant to purchase Danganronpa: Trigger Happy Havoc a year ago because so much Anime was hit or miss for me—still is, to be honest—but I’m glad I did. It hasn’t rekindled any lost love for the genre by any means, but it has become one of my favorite franchises. Danganronpa: The Animation is based on Spike Chunsoft’s PS Vita Interactive Mystery Novel, Danganronpa: Trigger Happy Havoc. It tells the story of 15 “Ultimate Students” who find themselves locked inside the once elite high school, Hope’s Peak Academy. The only recollection any of these students have is walking into the school and waking up to find themselves imprisoned together. Shortly after the main character Makoto Naegi meets the rest of the students, the maniacally sadistic teddy bear Monokuma calls them into the gym and tells them that the only way to graduate is to kill another student and get away with it. Following the discovery of a crime scene, the investigation period begins and everyone must scour over the evidence they collect and present them in the Class Trial. If the murderer is found guilty, they’re executed in a grandiose and macabre fashion. However, if the wrong person is accused, then everyone else dies and the murderer walks free. Seiji Kishi is no stranger to turning japanese video games into an Anime series; back in 2011 he directed Persona 4: The Animation. 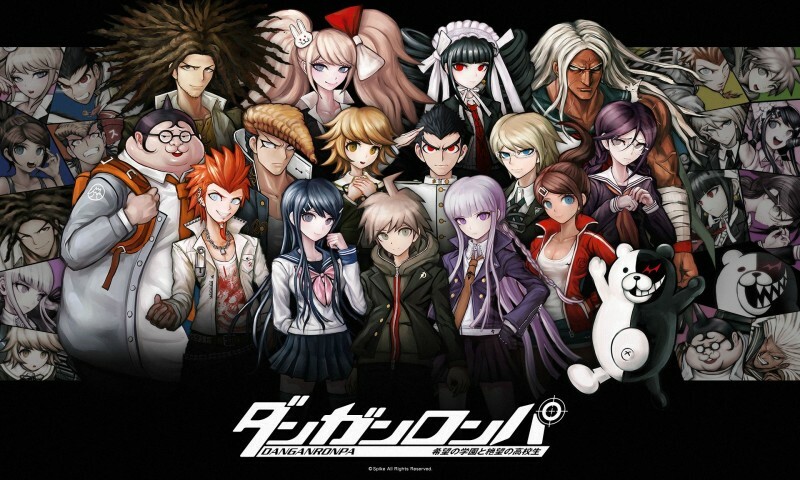 With Lerche helming production, Seiji Kishi and his team created Danganronpa: The Animation shortly after the game was released, but up until Funimation localized it, it was only available in Japan. They’ve stripped away the text filled interactions between each character during their daily “school life” to—thankfully—move the bulk of the story forward, while keeping the in-game cutscenes intact. Apart from streamlining the story and combining in-game cinematics, they’ve beautifully recreated the source materials’ meta-game aesthetics and presentation throughout the 13 episodes and it’s on full display for the Class Trials. Truth Bullets were loaded up to “shoot” contradictory statements, Hangman’s Gambit (a Duck Hunt-esq, Hangman) made a couple of appearances to spell out clues, and the Manga strips were laid out to recount the series of events, followed by the Slot Machine to celebrate (yes, celebrate) who was found guilty and the spectacular executions that follow. It’s funny, I had to forgive the absence of the original voice actors, especially Brian Beacock—the original voice of Monokuma from Danganronpa: Trigger Happy Havoc and Danganronpa 2: Goodbye Despair—I don’t typically care about that, but needless to say I fell in love this Anime adaptation. Not many TV shows or movies could match the source material beat for beat, in fact they’d probably fail horribly, but Kishi and his team are clearly in love with the Danganronpa universe and have crafted a fantastic visual experience by taking what was already a great presentation in the game and giving it a visual flow that’s so organically patched together, it’d be a shame not to applaud them for what they’ve achieved. However, for the people, like myself that like to take a peek at the behind the scenes footage to see how things were put together or even check out deleted scenes; don’t waste your breath. Extras include a commentary for the first episode and the option to watch the opening and closing credit songs independently. However, If you’re a fan of the series, you’ll love what Kishi and Lerche have put together. Danganronpa: The Animation is an incredible adaptation of Trigger Happy Havoc, and a great way to introduce people to the series.